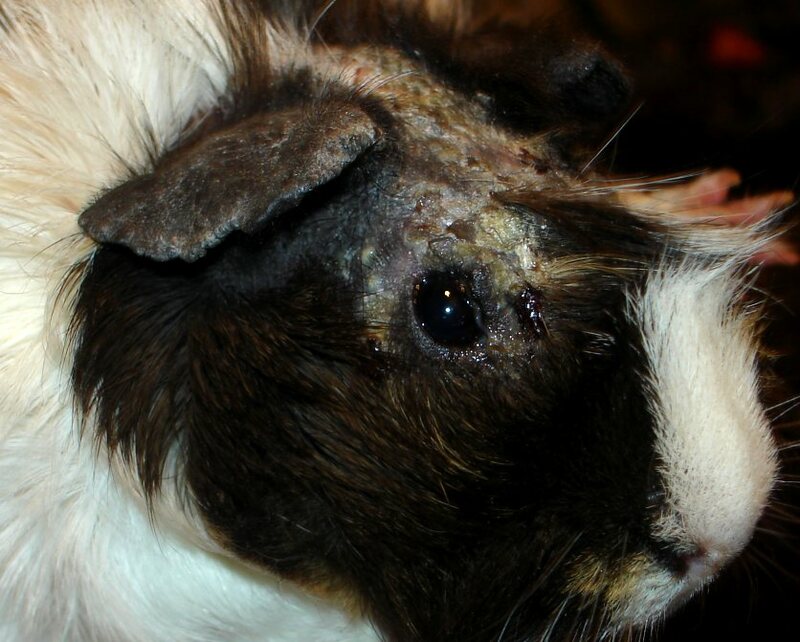 While the severe skin problems MichiganJoe's guinea pig suffered were not clearly diagnosed nor are we sure exactly what cured the problem, a summary of this case may be helpful to readers. 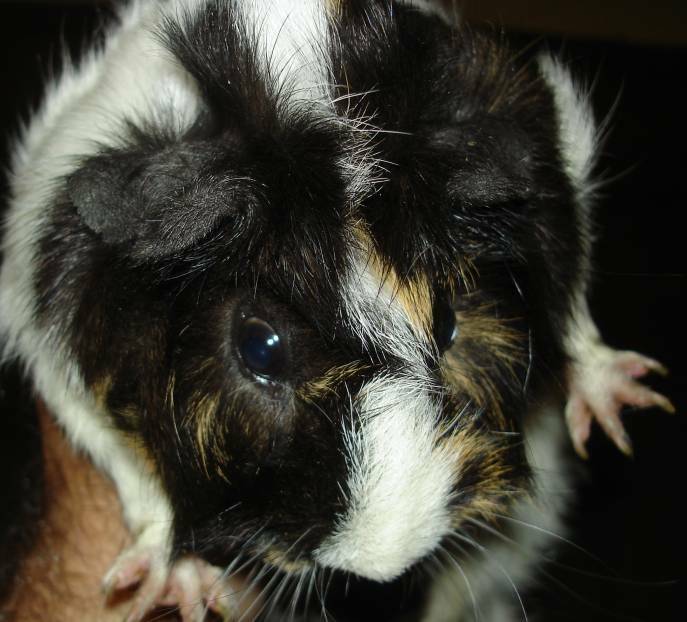 3/20/2007 MichiganJoe asks for help for his guinea pig Brownie. History: 3 weeks previously, he noticed the ears looking dry and flakey. Find below an early pic showing how the ear initially looked [apparent infection] that was an early sign there was something seriously wrong. 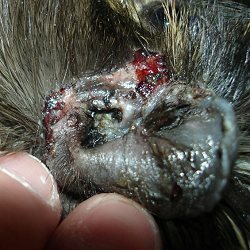 After she scratched her ear severely, MichiganJoe contacts a vet who thinks it is ear mites and recommends mineral oil to treat them. A day and a half later, the pig is scratching and mutilating itself severely and MichiganJoe takes Brownie to an exotics vet. 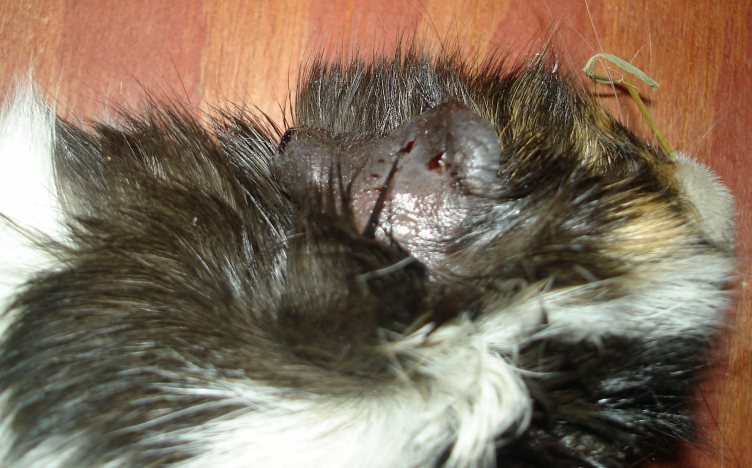 Brownie is treated with ivermectin and MichiganJoe is told to return in 14 days for second treatment. On day 8, Brownie scratches herself horribly on the face. 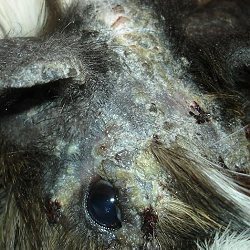 MichiganJoe gets the second treatment right away and has his second guinea pig treated also. MichiganJoe uses the body wrap described on the bandaging page in the Guide. The body wrap prevents her from scratching. He feels bandaging is extremely helpful during the course of treatment. Treating for mites and fungus is advised. 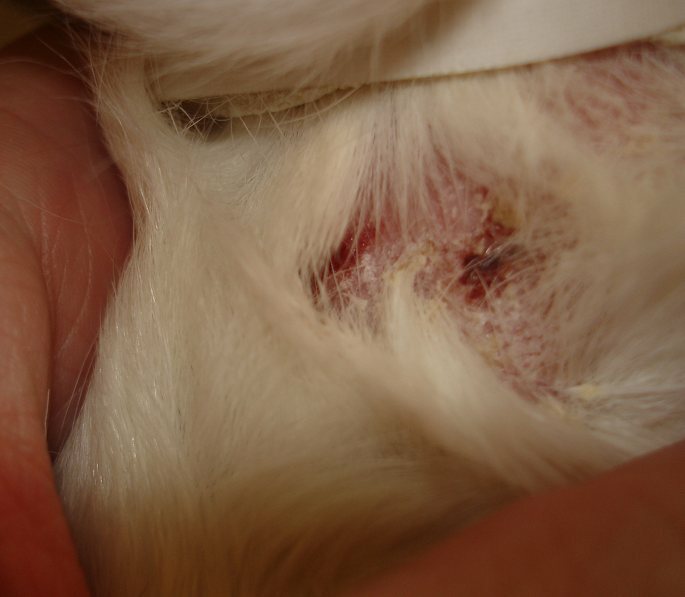 Treating 7 to 10 days apart is recommended for ivermectin instead of 14 days apart. Revolution can be used if ivermectin is not successful. 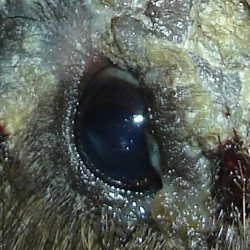 Revolution can also be used in combination with ivermectin in severe cases (Revolution is topical, the ivermectin would be given orally or by injection). Steroids or diazepam or cortisone are suggested to control intense itching. Program is recommended, two doses, 14 days apart. 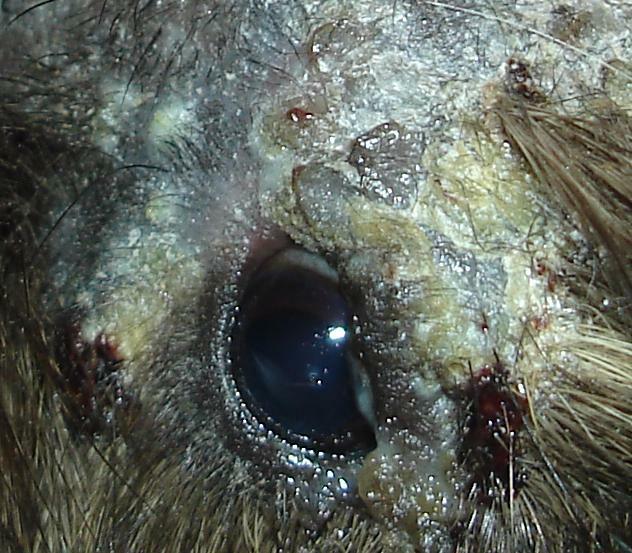 The white powdery part almost certainly is fungal but with the open sores and obvious infection (the honey-colored brown sugar-looking stuff generally indicates a staph infection), topical fungal treatments not advised. 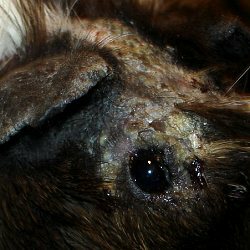 Demodex mites are suggested as a possibility. They can be notoriously difficult to get rid of and require multiple treatments. Michigan Joe says Brownie has been on Sulfatrim Suspension for some time. 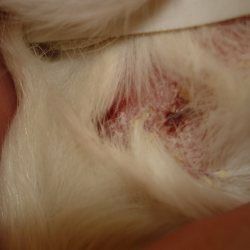 3/26/2007 The vet recommends an antibiotic scrub to clean the wounds (Chlorhexidine). A fungal culture is being done (results are not posted on the thread). 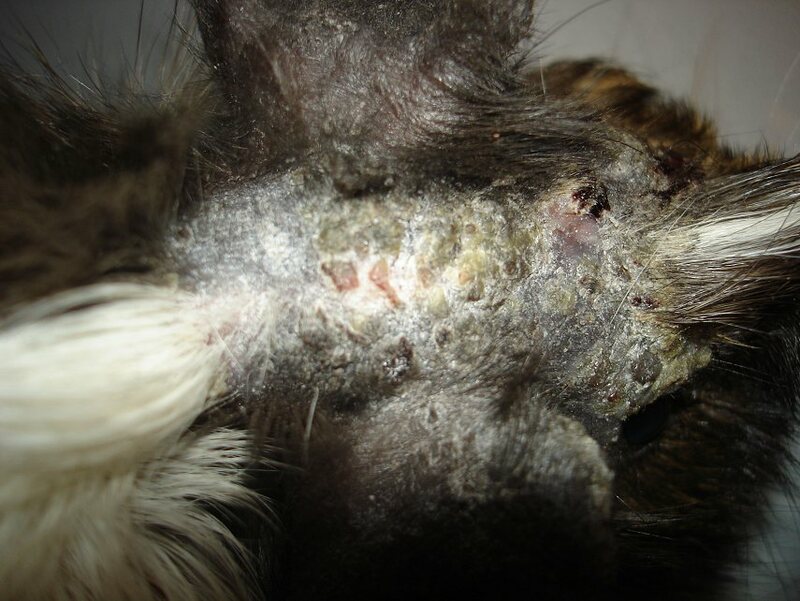 "Its been several weeks now and I thought she was getting better very slowly but today she started scratching at her body and I notice she has small clumps of white stuff on her body. I called they vet and they just wanted to give her ivermectin again which she just had 7 days ago. 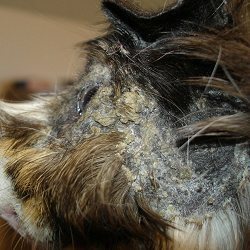 They said the culture for fungus wont be done till Wednesday but honestly if she starts getting worse I wont let her take it that long. I am already torturing the poor thing doing the cleanses every day. 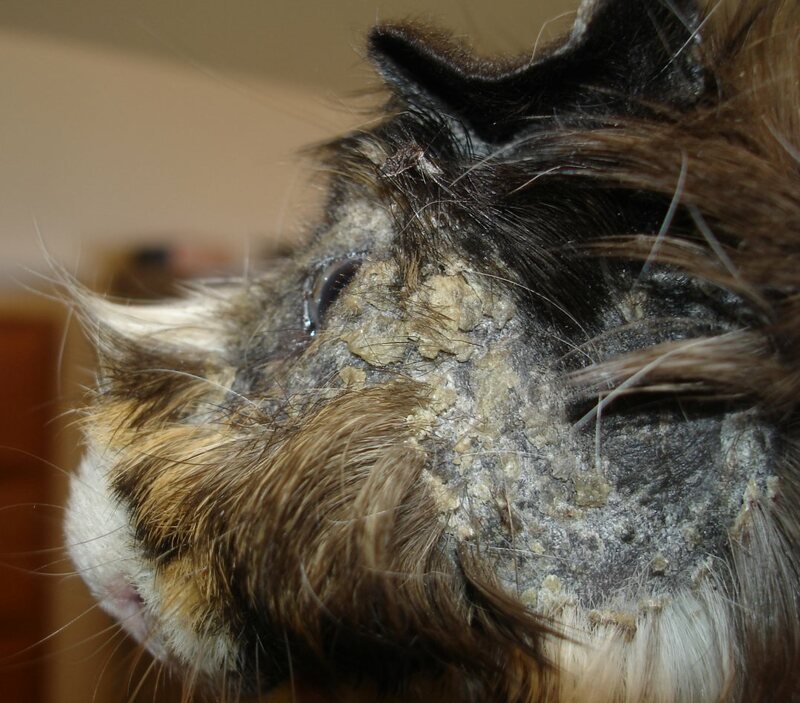 She has very little hair left on her head and what is left is coming off in large clumps"
It is suggested the treatments are helping, that this is likely a combination mite, secondary infection, and fungal problems and it may take a while to see results. "No she is not seizing and continues to eat and drink well. She is definitely in discomfort because of the significant amount of wrapping I now I have to use to stop her from itching. I just got done using the wash on her and found that over parts of her body her hair has a yellowish crust near the base and the hair just falls off leaving bare skin." 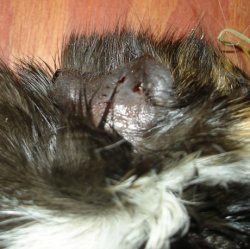 Metacam is suggested for the pain and Benadryl for the itching. 3/30/2007 This is a comparison pic (Newer vs. Older). She was first cleaned to remove the loose hair and debris. MichiganJoe writes: "Once we finally got her on Program I started seeing results after about a week and she started recovering quickly after that." Recovery pics sent 8/4/2007 show she is looking great! 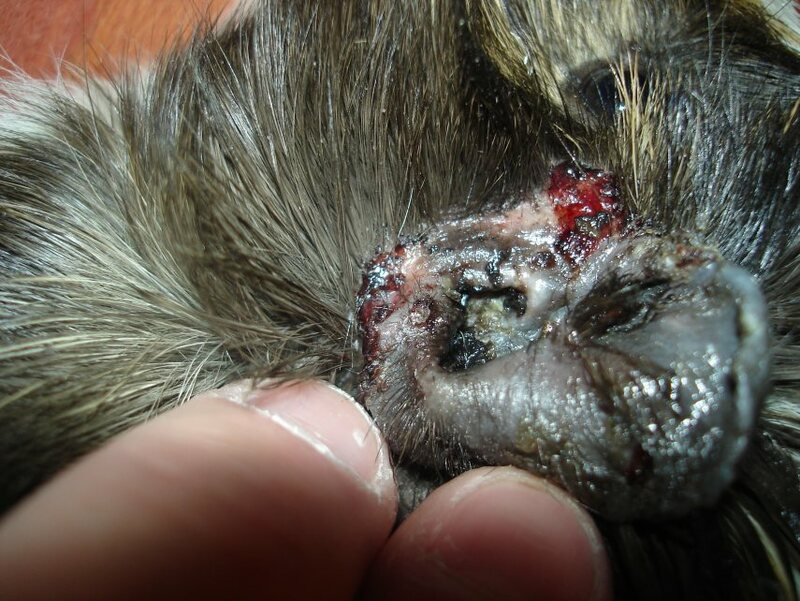 [Signs] Ear crustiness, ear infection, spreading of skin problem, itchiness with treatment. 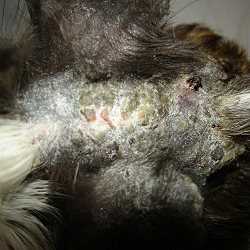 [Treatments] Multiple courses of ivermectin, body bandages, sulfatrim, Program for possible fungal infection. We don't really know what worked best but some of the ideas suggested here may help anyone with similar problems. 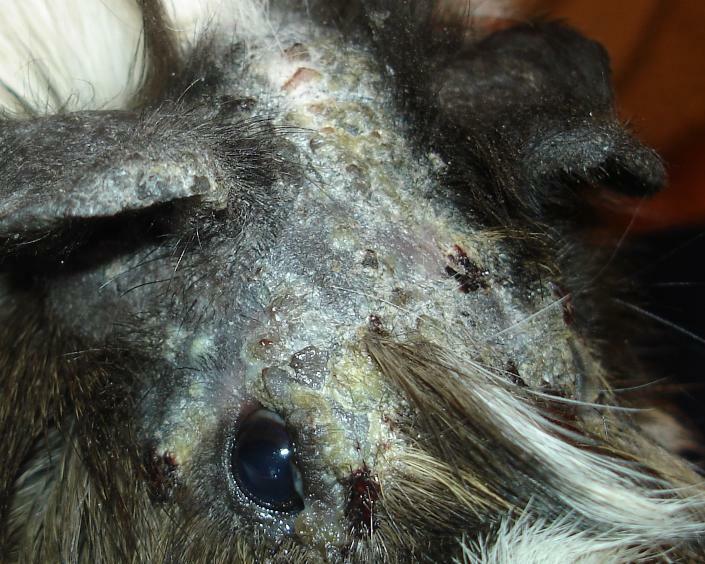 Note: Some guinea pigs with severe mite infestations have been treated topically with higher doses of ivermectin (1.0mg/kg rather than 0.5mg/kg).